Owing to the rich experience in this domain, we have been able to offer high quality Band Sealers to our valuable customers. 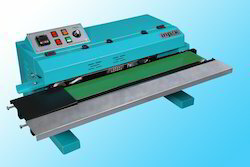 Offered product range is inclusive of Vertical Band Sealing Machines, Continuous Band Sealing Machines and Vertical Band Sealers. These machines are widely used in different packaging industries. We are among the industry veterans, engaged in offering Mini Band Sealing Machines to our priceless customers. The offered machines are characterized by gas strut adjustable pedestal and easy lift front cover. These machines are easy to operate and deliver long-term service to the customers. With their energy efficiency and minimal maintenance, these machines are highly appreciated by the customers.The offered machines are characterized by gas strut adjustable pedestal and easy lift front cover.